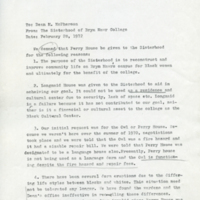 President Harris Wofford's response to The Sisterhood's demand for Perry House (see item #3048, "Letter to Dean Mary Patterson McPherson, 28 February, 1972"), officially designating the house as the new Black cultural center on campus. 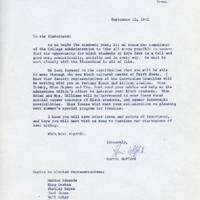 Letter from Bryn Mawr College President Harris L. Wofford to The Sisterhood, stating his and the College's commitment to the interests of black and minority students. 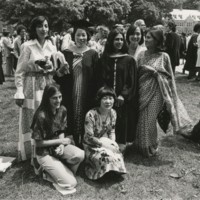 International students at Bryn Mawr College. 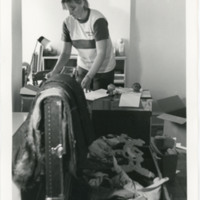 Woman in pants and a shirt reading "Bryn Mawr College" on upper left by a desk, open trunk of costumes in foreground. 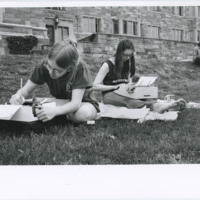 Two students sitting on the grass work on portable typewriters. 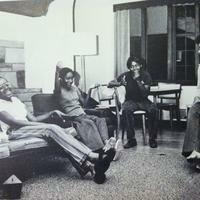 A dorm is in the background. 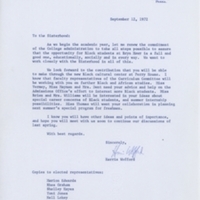 Inscribed on the back is "behind Rhoads". 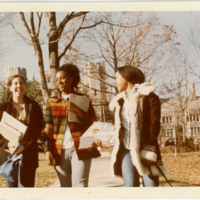 Three students walk from Pembroke Arch to Erdman. They're carrying books and notebooks and laughing.